Office Health and safety hazards cartoon. Hazards in a office environment. Spot the health and safety hazards cartoon. Office Health and safety hazards cartoon. Hazards in a office environment. Spot the health and safety hazards cartoon. 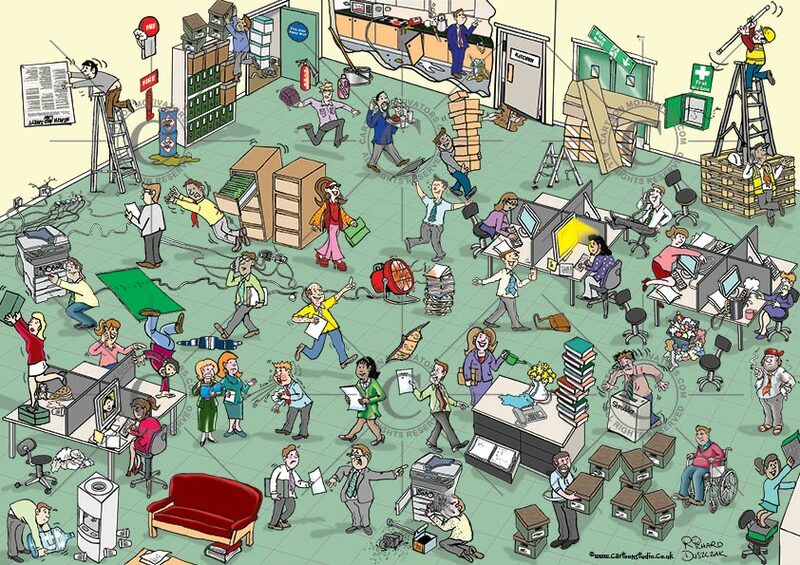 Numerous health and safety hazards illustrated in this office hazards cartoon. Health and safety cartoon for training purposes - ask your staff how many hazards they can spot? Some of the health and safety hazards include: Hanging Health and Safety Law poster upsidedown, fire alarm bell has cloth to stop bell ringing, fire extinguisher missing, leaking chemicals stacked upsidedown, guy climbing racking dangerously, fire door propped open with fire extinguisher, Blocked fire exit, mop and bucket left in aisle, ripped carpet, light fitting unsafe, guy carrying big boxes not seeing trip hazard, overloaded socket, over flowing waste bin, smoking hazard, trip hazard, person in really high heels, wire going under mat, pool of water on floor, dirty kitchen work surfaces, electric hob left switched on glowing red, spilled substances, door hanging off, changing light fitting but using pallets under ladder to reach it, talking on phone not concentrating, messing with photo copier with screwdriver, filing cabinet overbalancing with top heavy draw left out, guy with contagious spots, stood on desk reaching, larking about doing hand stand, walking into slippy mess on floor, broken office chair, lifting heavy bottle of water, mess around drinks fountain,sneezing near colleagues, boss bullying worker, chair leg broken, toner coming out of copier, inhaling toner dust, drawer on cabinet left stuck out - trip hazard, twisting with heavy load, water near electrical appliances, handbag left on floor - trip hazard, too close to computer screen, drunk while working, office fan heater too close to paperwork, broken step ladders, carrying too much, feet up on desk leaning backwards, kettle boiling on desk - scolding risk, unsafe plugging monitor in,scruffy worker smoking, tie stuck in shredder, blocked way for wheelchair user, boxes left all over floor, stood on office chair reaching up, pile of book on edge of desk, ripped carpet - trip hazard, running in office, guy with hot drinks about to be knocked over, empty first aid box. A2 in size 59.4cm x 42cm deep. Ideal for training staff/colleagues to be more safety conscious. File size is nearly 28MB so please be patient when downloading.